Finsbury Park to Alexandra Palace gravel cycle ride and a gem in London. If you want to see what a real linear park looks like, you have to go to north London’s Finsbury Park and follow the now abandoned railway from Finsbury Park to Alexandra Palace and through Stroud Green, Crouch End, Highgate and Muswell Hill. The railway was part of London’s rapid expansion in the 19th century and was built in 1860 by the Edgware, Highgate and London Railway running from Finsbury Park to Highgate with the aim of linking to Edgeware. It was taken over by Great Northern Railway to continue to Alexandra Palace as part of their branch lines to service Finchley and High Barnet. In the 1930’s it was proposed to integrate it into the Northern Line as part of London’s tube system. The outbreak of the Second World War saw this plan lapse and passenger trains stopped working the line in 1954. In 1964 freight traffic also ended and the route was ultimately abandoned. 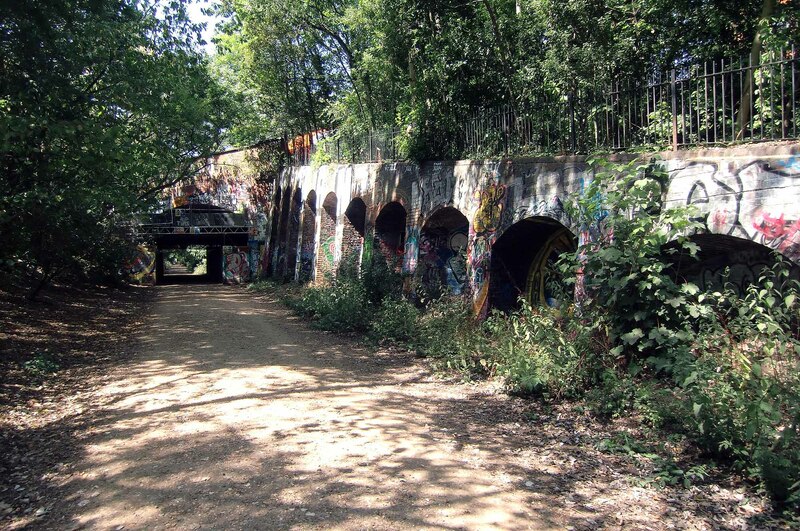 After a fight and developers repulsed the Parkland Walk was created and it follows the old railway line and is protected as a site of scientific interests. The surface is mostly gravel and flat, the route is split into two sections with the North Section stopping at what was once Highgate Hill Station where it entered tunnels under Highgate Woods, these are now closed and are a refuge for bats. To continue onto the north section, you must briefly enter the harsh and noisy world of London main roads to regain the route at Cranley Gardens. You can lessen your exposure to London traffic by entering at Gypsy Lane Gate and the ancient Highgate Woods (Saved from developers by the same acts of Parliament as Epping Forest and Highgate Cemetery is also nearby) before re-joining the Parklands Walk at Cranley Gardens, It is worth the effort because the views of London from the North Section are amazing. Cycling in Highgate Woods is banned so you need to pedal along the main road to link back onto the route. The Parkland Walk linear park is very much a place where you can go ‘Roubaixesque’ by linking it together with other routes.